This entry was posted on April 5, 2013. Bookmark the permalink. Like many of my adventures, it all begins with a run. This morning I was running through Golden Gate Park and the conditions were good–the sun was shining, people were pleasant, so no real craziness to report. Rounding back through the Pan Handle I actually started to think to myself, ‘This is actually a quite normal day,’ and for a split second I felt a bit disappointed, like I was hoping for something to pop out and give me my laugh for the day. And that’s when it came. 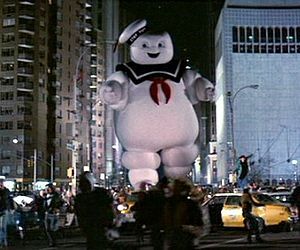 That split-second disappointment was like the Stay Puff Marshmallow Man of Ghostbusters: it summoned the San Francisco gods of craze and presented me with my deepest desire– a ridiculous encounter. Seconds later my wish was granted. As I ran past the basketball courts in the Pan Handle, a bum started singing to me while the rest of his crew did its thing: “Go go, get it, get it, go go, get it, get it, guuuuurl.” He then cracked open his can of Tecate, raised his beer to me, and chuckled. It was 8am.